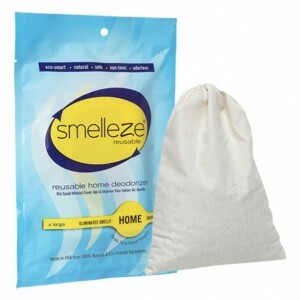 SMELLEZE Reusable Refrigerator Odor Remover Deodorizer Pouch: Destroys Stench in 300 Sq. 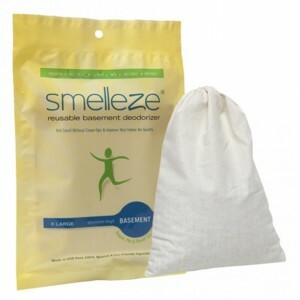 Ft.
SMELLEZE Reusable Refrigerator Odor Remover Deodorizer Pouch: Destroys Stench in 300 Sq. Ft. Summary Smelleze® Reusable Refrigerator Odor Remover Pouch removes refrigerator odor without masking with harmful fragrances. Freezer & refrigerator smell doesn't stand a chance! Also keeps food fresher longer & reduces energy bill. Smelleze™ is reusable & lasts a year. Safe for people, pets & planet. This eco-friendly refrigerator odor remover deodorizer really works! Features & Benefits • Simply place in refrigerator & smell the difference • Eliminates fridge small without masking it • Helps keep food fresher longer • Superior to baking soda products • Eco-friendly, reusbale, safe, natural, non-toxic, odorless • Made in USA Eliminate Fridge Odors While Keeping Food Fresher Longer & Reducing Energy Bills A common problem with refrigerated food is that it acquires an unpalatable taste because of odors transferring from one food to another and freezer burn. In extreme cases, your fridge could also acquire nasty odors from rotting food. If you have a horrible smell in your refrigerator or freezer that you can't seem to get rid of, Smelleze® Refrigerator Smell Removal Pouch can help! The Smelleze® Refrigerator Smell Remover Pouch was developed to absorb and eliminate all fridge and freezer odors on contact without masking them with fragrances. Even rotten meat has no chance and Smelleze® Refrigerator Odor Removal Pouch will ensure that you won't lose your appetite when you open your fridge door. Unlike other products, Smelleze® Refrigerator Odor Remover Pouch will also absorb ethylene which causes premature ripening and moisture. This will result in your food staying fresher longer while your energy bill is reduced. It is also significantly superior to products like baking soda and charcoal. For a breath of fresh air, simply place the reusable Smelleze® Refrigerator Smell Neutralizer Pouches in your fridge, cooler or freezer and smell the difference. This product can also be used during moving and storage to absorb refrigerator odors. To rejuvenate periodically, simply heat in a microwave 2-4 minutes or place in direct sunlight for a day and reuse. Replace when rejuvenation does not help. Smelleze® Refrigerator Smell Eliminator can work for years so it is very cost effective. Smelleze® Refrigerator Odor Neutralizer Pouch is non-toxic, safe, reusable recyclable, natural, odorless, non-flammable and non-caustic. Smelleze® Refrigerator Deodorizer is an ideal environmentally friendly solution for eliminating unpleasant refrigerator, freezer and cooler odors without adding pollutants to the air you breathe. It does not contain VOCs, harmful or ozone depleting chemicals and is especially beneficial for those suffering from allergies and chemical sensitivity. No fossil fuels are used in the production of Smelleze® odor eliminator deodorizer media.